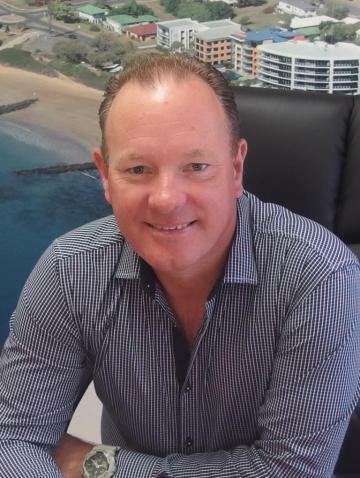 Bargara Real Estate was purchased in 1983 by Mick Beer, Paul's father who developed the business from a small two man office to servicing the coast in sales, property management and holiday accommodation. Paul originally from Coonabarrabran has lived in Bargara since 1981 when he was 10 years old, attending Kalkie State School and Shalom Catholic Collage. Paul joined Bargara Real Estate as a sign boy hammering stakes and fixing any broken signs of his fathers. After 2 years working at Bullo River Station with Sara Henderson Paul returned home to Bargara and joined the agency once again as an agent. In 2001 Paul took over the business. Paul has a broad and indepth range of property knowledge, skill and expertise. Paul holds a Licenced Real Estate and Auctioneers licence and has developed a wide range of contacts over the past 23 years in the area. Paul now enjoys time with his family fishing at his nearby shack and teaching his children how to catch and cook mud crabs. Situated right on Kelly’s Beach, overlooking The Basin is this absolute stunning 3 bedroom ground floor apartment. Situated in a small complex and boasting; • 3 bedroom & ensuite • 2.7m high ceilings • Fully duced air conditioning • Lovely timber decks • Underground car parking • Only 50 meters to Golf Course • Overlooking sparkling in ground pool This unit truly is unique. Ideal for holiday rental. Get in quick for this one! Offers above $699 000 Phone Paul Beer direct for your private inspection. COASTAL LAND CENTRAL TO ALL FACILITIES We have the last two lots at the popular Golf Links Estate available now! Build in this quality estate and enjoy the convenience of being located so close to Bargara’s facilities. Major shopping, cafes and beautiful beaches are all close by. LAND AVAILABLE: Lot 64 AREA 738m2 $162,000.00 Lot 100 AREA 726m2 $172,000.00 The estate is protected by a sensible covenant to protect your investment. To receive an information pack on this great opportunity, contact your local professional sales team at Bargara Real Estate. Surf and sand just a short stroll away from this magnificent Penthouse situated in the heart of Bargara and an effortless walk to cafes and restaurants, a golden opportunity for that sea change. Fully furnished, 193 square metre apartment with 3 bedrooms 2 bathrooms 2 car park. This well appointed unit across the road from the beach is in the perfect location at Bargara Beach. Situated a short walk from the main alfresco dining mall, hotel, golf club, bowling club, boat ramp and beautiful parkland. The apartment features 2 large bedrooms, en suite and multi purpose room, secure basement parking, courtyard over looking pool beach and reef reputed to be the best on shore diving on east coast. This unit is situated in an amazing location within the Royal Palms complex on Miller Street, right on the beach overlooking the Bargara Golf Course. Boasting 2 bedrooms, 3 bathrooms, ample living areas, new paint, 2 car accommodation and beautiful furnishings. Just a short stroll to Bargara's restaurants and golf club. To be sold walk in walk out, ready for owner occupier or holiday rental. It won't last long at this price! $520,000 Walk in walk out. Phone exclusive agent Paul Beer for an inspection, but be quick!! THE PERFECT COASTAL BLOCK TO BUILD ON. A MODERN-DAY QUALITY HOME, SIDE ACCESS, FULLY FENCED, NEAR OCEAN, GOLF COURSE AND OCEAN IN-LET. Features include: - 3 good sized bedrooms all with ceiling fans, feature walls and BIC. The master is stunning with a large well appointed en-suite, WIR, air-conditioner, ceiling fan and garden views. - Gourmet styled island kitchen with quality stainless steel appliances, gas cook top, large cupboards and stone bench tops. - Adjacent the kitchen is dining and a large open plan family/TV rumpus room. - Sun room/enclosed patio overlooking the back garden area, an ideal area to sit and relax. - Main bathroom with quality tiles to the ceiling and a separate toilet. - Beautiful bamboo hardwood floors throughout. - Good cupboard packing space. - Laundry with BIC and access to the outside washing line. - 2 car accommodation with remote. - Solar system for a good green footprint and reduced electricity bills. - Fully fenced with an further entertainment area...excellent side access for caravan or boat. - Air-conditioned....security screens, big garden shed with two door entrance and more. CALL THE EXCLUSIVE AGENT BRUCE SLATER TODAY AND BOOK AN APPOINTMENT TO VIEW.